Well! Talk about final count-down time... We’ve gotten to the point when an email to Ben asking if he can think of anything else I should add to the registry completion order elicits “A Baby!” in reply. And while I’m still not at that “get this child out of me, stat” phase, I’m certainly getting more uncomfortable by the day. I blame the return of nasty humidity, though I’m grateful that we celebrated our joint-birthday weekend with fabulous weather reminiscent of my home state, Oregon. Aside from the weather and low-key gatherings with friends, the rest of the birthday weekend of spent “celebrating” with essential errands: Returning the darling orange lamp to Ikea because it turned itself on every so often, ordering a table for the nursery, picking up the carseat-to-stroller adapter... We also finally made it to Diaper Lab to explore the cloth diapering options. -Waterproof cloth liner for a small (13 gallon) plastic trash can. (She recommended keeping the big plastic bag from drop-off/pick-up in a back hall and doing a transfer every day or two to reduce odor.) 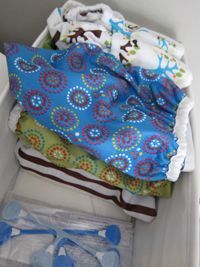 -6-8 Waterproof covers for the pre-fold diapers the service will provide. -2 sets of Snappi diaper fasteners: These may be the most amazing innovation in cloth diapering since we were kids; they replace pins with a one-handed stretch-and-clip movement. So clever and easy. (http://www.diaperlab.com/shop/snappi-size-1.html# ) -A wet bag for bringing dirty diapers home. The start-up costs are pretty steep, but even three months of diaper service plus the stuff we bought ends up being cheaper than disposables. We will go back for the full set of cloth inserts, etc. in a few months. (The store offers a trial program so you can try out a bunch of different styles before committing.) Laura also recommended Nature Babycare disposables for travel, since you have to be pretty hard-core to tote dirty cloth diapers on an airplane; I found them at Babies R’ Us and they are also available at Diapers.com. As I was writing this the buzzer went off with a delivery. 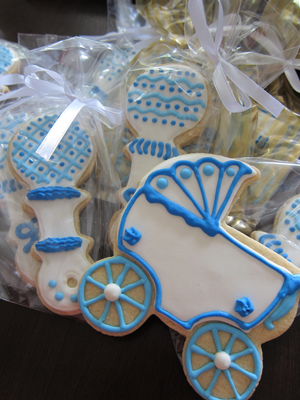 My friend Nicole, who is one of those people with a sneaky hidden talent that you’d never guess from her uber-businessy day job, has started making customized cookies for parties and favors, and she sent us a whole box of beautiful rattles and baby carriages. I already ate two of them; unlike most pretty cookies, hers taste great! I’m so impressed by this sort of thing, aren’t you? I’ve been joking that I want the baby to come next Monday, so his birthday is 8/9/10. If he cooperates, there are just a few more things I *really* need to take care of: -Infant CPR class, scheduled for Saturday (I know, pretty last minute...) -Wash the baby clothes and blankets and things from the shower -Pack a hospital bag!